Give yourself an experience with thrill and adrenaline. Our escape rooms are surprisingly technical with ingenious puzzles. This escape room will give you a fun and challenging day you will never forget! The submarine: The Russian submarine K-129 has mysteriously disappeared 20 years ago. It was last seen in the North Pacific Ocean. The vessel has a dangerous nuclear load on board and to this day has not been located. It is crucial that this submarine is found before it falls into the wrong hands. Can you solve the mystery of the submarine? 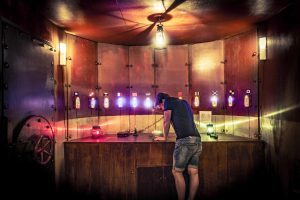 Locked Amsterdam makes your escape room experience unforgettable because of the atmosphere; the set and the storyline fuse perfectly. Make sure you don’t miss it!